Detailing the physical features, habits, territorial reach and other identifying qualities of the Western Leaf-footed Bug. The Western Leaf-footed Bug goes crazy for some of the healthiest and most popular nuts on the market. Despite its name, the Western Leaf-footed Bug has a reach that covers more than half of the continent. The bright zigzag stripe across its 'waist' looks like a belt, making it a great feature for identification. A small spine at the front of the head is also distinctive. The hind legs are longer than the front pairs and have small spines on them. The lower part of each back leg has a flat and wafer-like tibia with a small light mark on one side. The area above and below this leaf-like expansion is yellow. Black and yellow bands border both sides of the abdomen. This species can produce a detectable odor in defense of a threat or attack. Western Leaf-footed Bugs are herbivores, feeding on the buds and nuts of various shrubs and trees. Pistachio and almond trees are popular food sources, making this insect a pest in orchards. They are also fond of trees and shrubs in the Juniper family and can sometimes have a population explosion in areas where many of them grow. They are also called Juniper Bugs. 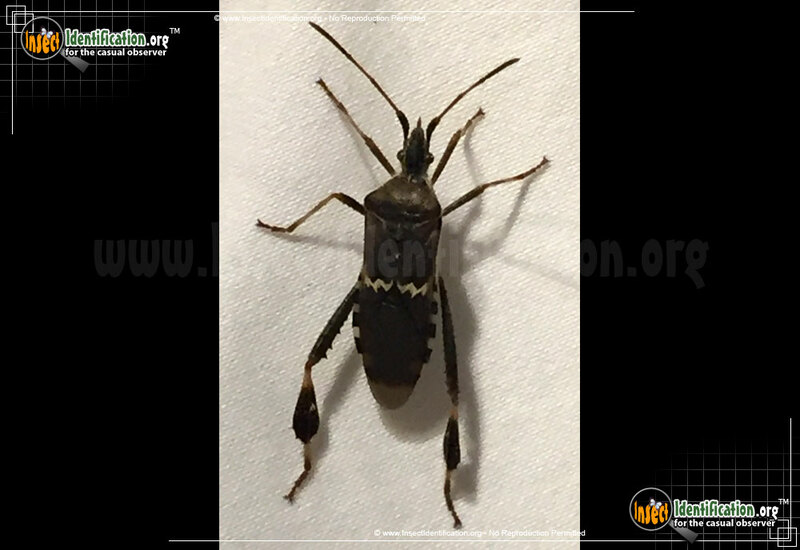 Look for Western Leaf-footed Bugs in woodlands and orchards. They may be found in large numbers on a single bush or tree. In the cold winter months, adults seek shelter under insulating leaf litter. Two to four generations can be produced each year.